This story was published in the University of West Florida’s Fall 2018 alumni magazine, Connection. In January, six students from Florida State University’s School of Physician Assistant Practice will come to Pensacola to complete 12 months of clinical rotations in area hospitals and private medical practices. They are part of a cohort of 40 students admitted to the highly competitive 27-month program that culminates in a master’s degree in physician assistant practice. A new pipeline agreement between the University of West Florida and FSU guarantees spaces for a select number of students coming from Florida’s Panhandle. Just this August, a new class began the program, and all eight spots for Panhandle students were filled by UWF graduates. Dr. Michael Johnson, associate professor for the UWF/FSU Physician Assistant Pipeline Program, said the program aims to support high-achieving UWF students throughout their preparation for and application to PA school. The program positions graduates to connect with jobs in Northwest Florida, where demand for PAs is high, and the average yearly salary is approximately $102,000. “My goal as a PA will be to not only improve individual lives through the care I provide but also work to meet community needs, such as increasing access to care in rural area and areas with the most need,” said Meghan Albano, ’15, who earned a master’s degree in public health from UWF and began the FSU program this fall. The second floor of the University Park Center on campus is a hub for partnerships and programs like the PA Pipeline. Faculty and staff from the UWF Usha Kundu, MD College of Health and the FSU College of Medicine’s Pensacola Regional Campus meet with students and community partners in shared office space. Medical classes for students and continuing education courses for local physicians also take place there. 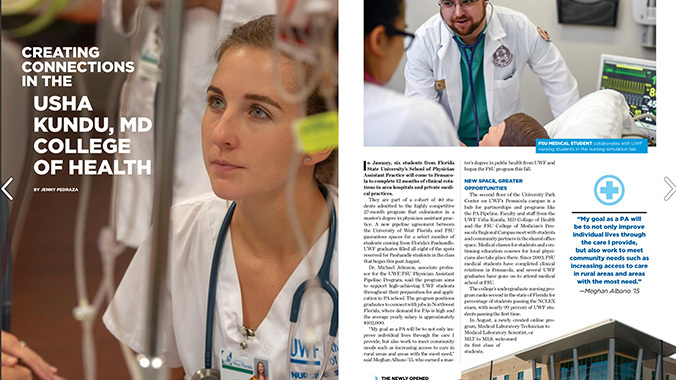 Since 2003, FSU medical students have completed clinical rotations in Pensacola, and several UWF graduates have gone on to attend medical school at FSU. Additional university partnerships have also allowed UWF to expand offerings in nursing to prepare professional nurses for leadership positions, advanced nursing roles and doctoral studies (including a cooperative doctorate with the University of Florida). The college’s undergraduate nursing program ranks second in the state of Florida for percentage of students passing the NCLEX exam, with nearly 99 percent of UWF students passing the first time. In August, the first students began in a newly created Medical Laboratory Technician to Medical Laboratory Scientist, or MLT to MLS, program, which is offered through Complete Florida. Creating these types of partnerships is a key priority of the UWF Usha Kundu, MD College of Health. Under the direction of new dean Dr. Denise M. Seabert, the college is poised to strengthen its role in community health throughout the Pensacola region. Key focus areas include working within the community to provide access to primary care, reduce emergency room visits for routine care and help area children be ready to learn at school. Seabert, who comes to UWF from Indiana’s Ball State University, has spent her career focused on the professional preparation of health educators. For more than 20 years, she has provided leadership in obesity prevention, HIV education and academic standards for health and wellness. Seabert hopes to inspire collaboration within the college, and it will start internally. A new initiative invites each department to host a brown bag lunch, where faculty members can learn about other departments’ programs, outreach and research. This internal connectedness on campus will inspire interdisciplinary projects and aid student learning and retention. Several new faculty members have joined the college during this time of change. Dr. Crystal Lee joined the UWF Department of Public Health as an assistant professor. Born and raised on the Navajo Reservation in Arizona, her research focuses on Native American/Alaska Native health and examining Indigenous health policies at a tribal, state, national and international level. Dr. Jeffrey D. Simpson joined the Department of Exercise Science and Community Health as an assistant professor of biomechanics and motor control. He will serve as the director of UWF’s state-of-the-art biomechanics laboratory. Dr. David B. Strohmetz is the new chair in the Department of Psychology. He comes to UWF after 22 years at Monmouth University in New Jersey, where he served as chair of the Department of Psychology and associate vice president for academic and institutional assessment. Dr. Jacqueline Thomas comes to UWF as an assistant professor in the School of Nursing after 23 years of experience working as a family nurse practitioner in community health clinics, private practice and public health. Donor support continues to build the college’s momentum and capacity. In 2017, a $5 million gift from Dr. Usha and Mahadeb Kundu led to the enhancement of educational and experiential opportunities and naming of the college. In 2016, a $250,000 gift from the D.W. McMillan Foundation was given to support UWF’s undergraduate nursing education, naming the program the Dr. D.W. McMillan BSN Nursing Program. Most recently, the college celebrated a $250,000 gift from the Earl Hutto Foundation to name the Earl and Nancy Hutto Master of Science in Nursing program in the UWF School of Nursing. Next on the horizon for the college is to explore a physical community presence in Downtown Pensacola and continue to enhance ways students across disciplines can gain meaningful clinical experiences through simulation labs.